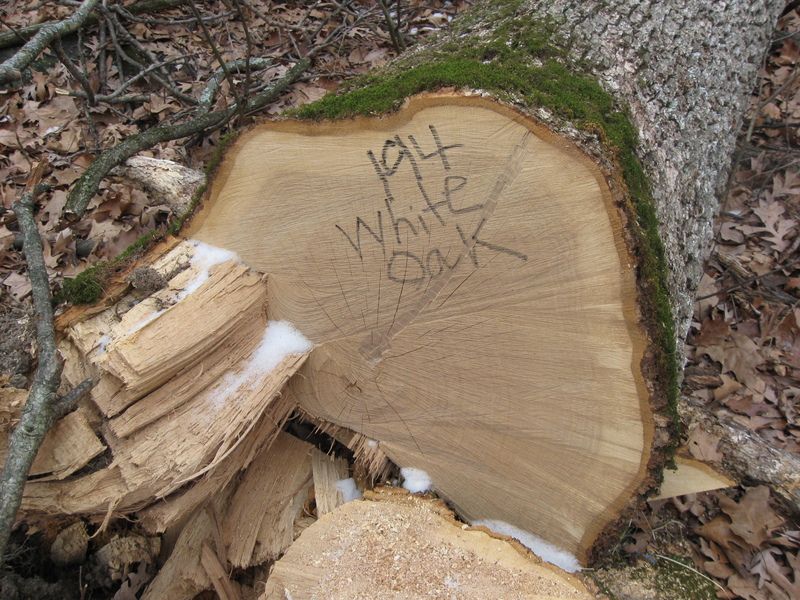 This White Oak, which we have labeled Witness Tree #2, was cut down by the National Park Service a couple of weeks ago. It was 166 years old, and about 20 years old at the time of the battle. 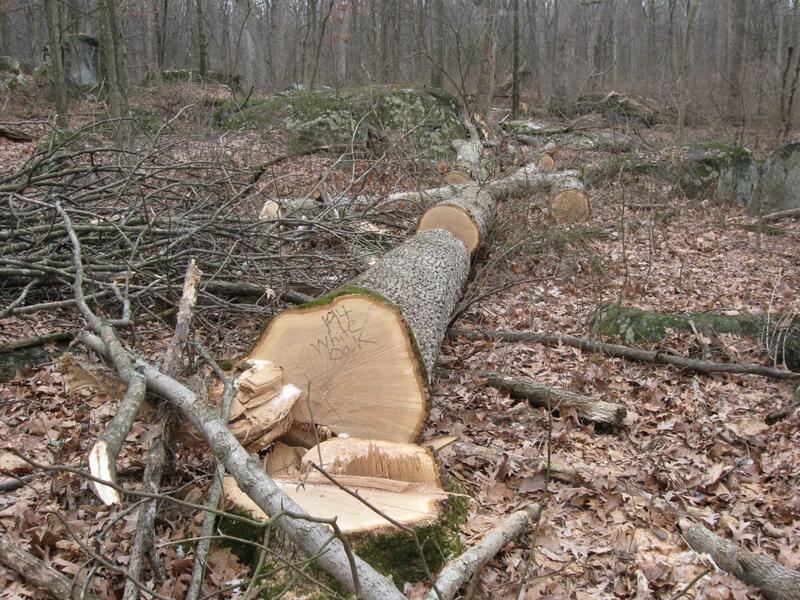 It was cut down as part of a project by the National Park Service to thin out forested areas on the battlefield. The project is intended to allow other smaller trees to grow taller so that the smaller trees can be cut down when they reach maturity. This view was taken facing west at approximately 1:00 PM on Sunday, January 18, 2009. In the last three weeks, the National Park Service has cut down three more witness trees at the south end of the battlefield. They are all within a couple of hundred yards of each other. 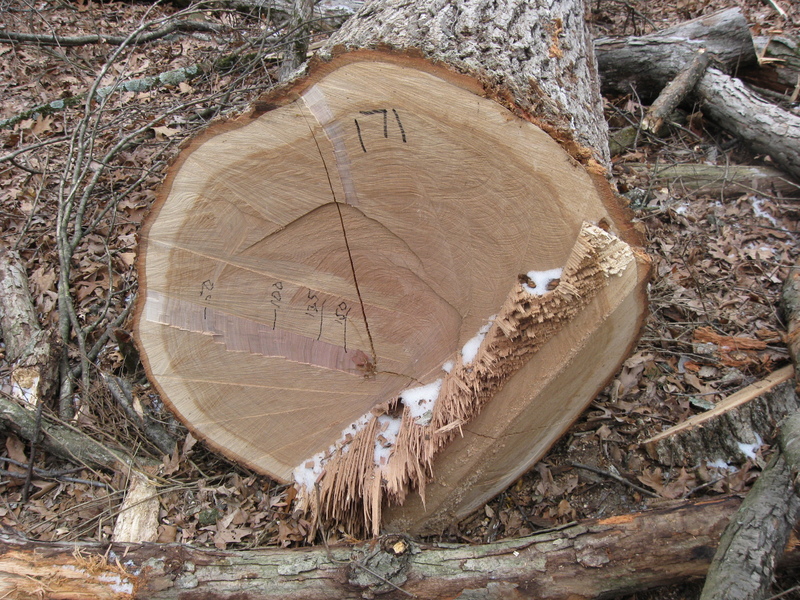 We have been very amused in the last day or two by those defending the National Park Service in the felling of a 229 year old witness tree in this area (which we documented in our post on January 17, 2009). The defenders state that “well, when you cut down hundreds of trees, you’re bound to make some mistakes and cut down some witness trees.” Really? So cutting down hundreds of trees at a time makes it okay to be sloppy and to cut down witness trees if it’s too inconvenient to check to see how old they are? We are big fans of the battlefield rehabilitation, but this was a wooded area during the battle, and it’s a wooded area now. If there is any doubt at all about the age of trees, why not leave them up? These four witness trees were in an area of less than an acre. The National Park Service is thinning out dozens (hundreds?) of acres from Seminary Ridge to Big Round Top. We haven’t checked all of the hundreds (thousands?) of trees that are down. How many more witness trees have fallen to this policy? Remember when witness trees were valued at Gettysburg National Military Park? It was only last August when a witness tree in the National Cemetery was struck by lightning, and the National Park Service received a lot of publicity from the Washington Post, New York Times, CNN, Philadelphia Inquirer, National Public Radio, etc… about what a shame it was that “the last living link to America’s bloodiest battle” was almost destroyed. The National Park Service milked that for all it was worth, didn’t they? Of course, that was right after the tree was struck by lightning and when some officials of the National Park Service were clueless about how many witness trees were actually on the battlefield. Now that they realize that there are more, it appears that the witness trees aren’t as important. Well you can’t have it both ways. Either they are important (and you receive great publicity for attempting to preserve them) or they’re not (and you don’t really care when they’re struck by lightning, or when you cut them down). We’re not tree huggers by any means, but we think that they are as important as the National Park Service used to think that they were. As the National Park Service spokesperson told one media outlet, “It’s always amazing how passionate people are about witness trees at Gettysburg.” It’s too bad that some employees of the National Park Service at Gettysburg don’t have some of that same passion. 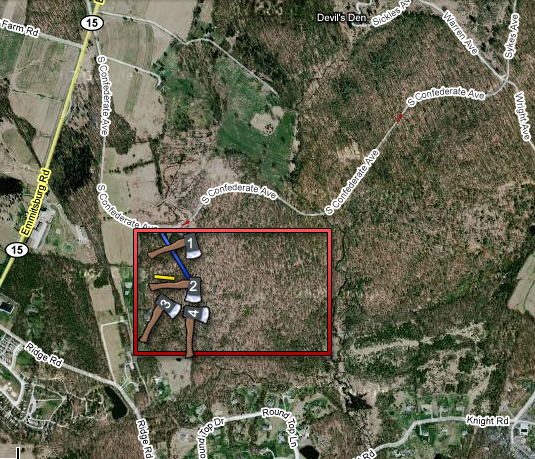 The area in red is one of the the primary areas where the National Park Service is “thinning” the woods. The blue line is a trail that goes into the area from South Confederate Avenue. The hatchet (labeled #1) is the 229 year old witness tree that the National Park Service cut down in August, 2008. 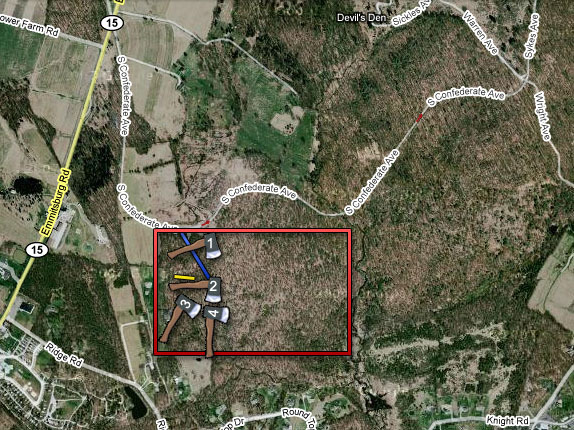 The yellow line represents the stone wall that trees have fallen over and damaged. We also show the general locations of witness trees #2, #3, and #4 by hatchets laying in the approximate direction and areas where they witness trees are laying. These lines are not to scale at all. This map was created at approximately 7:30 PM on Sunday, January 18, 2009. “It’s a shame when you lose the last living entities on this battlefield,” a National Park Service spokesperson told Fox News on August 9, 2008, regarding the honey locust tree in the National Cemetery. “Nothing lives forever, unfortunately.” Here is the stump of Witness Tree #2. It started growing around 1843. 1843 was the year that the first wagon train traveled on the Oregon Trail. Ulysses S. Grant graduated from West Point. Charles Dickens’ A Christmas Carol was published. Noah Webster and Sequoyah died. 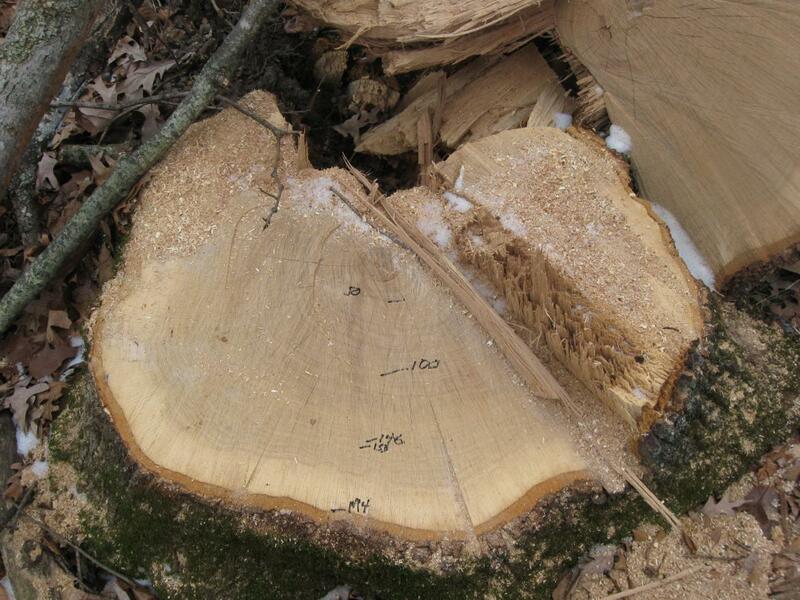 We have marked the tree rings as we counted them. This view was taken facing west on Sunday, January 18, 2009. The National Park Service is following directions on the proper way to thin trees from experts at Pennsylvania State University. They are cutting down one out of every four trees this time, and they are to come back and cut down 63% during the next round. This should promote a healthy forest. 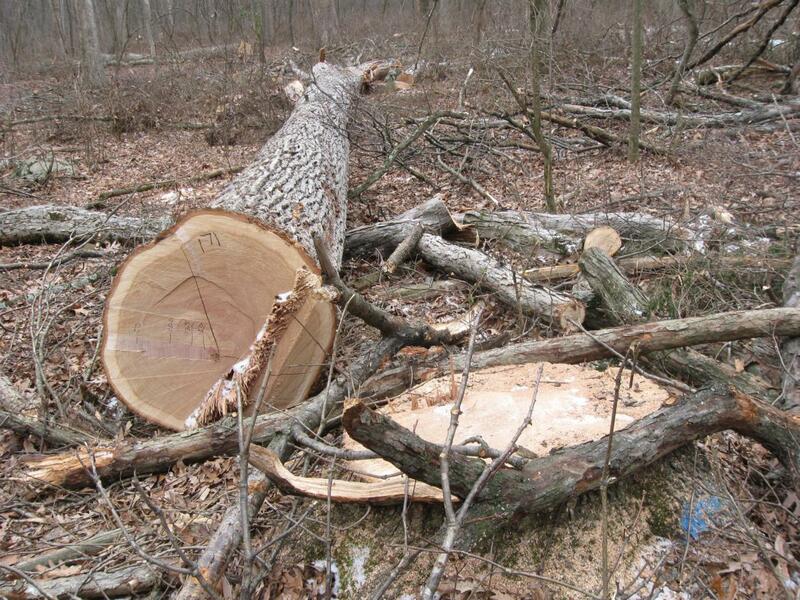 So cutting down healthy trees like this promotes a healthy forest? 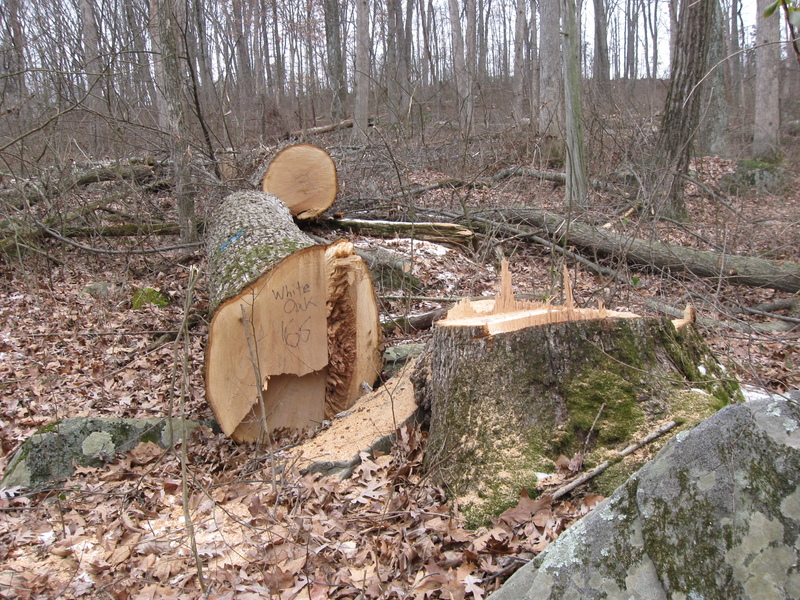 How many more witness trees will go when they start taking out 63% of the trees that are left? This view was taken facing west at approximately 1:00 PM on Sunday, January 18, 2009. Witness Tree #3 is a Red Oak that was 171 years old, or approximately 25 years old at the time of the battle. When it started growing around 1838, Frederick Douglass escaped slavery from a Maryland plantation. The Cherokee were forcibly relocated on the Trail of Tears. Ironically, 1838 was the year that naturalist John Muir was born. This view was taken facing southwest at approximately 1:00 PM on Sunday, January 18, 2009. 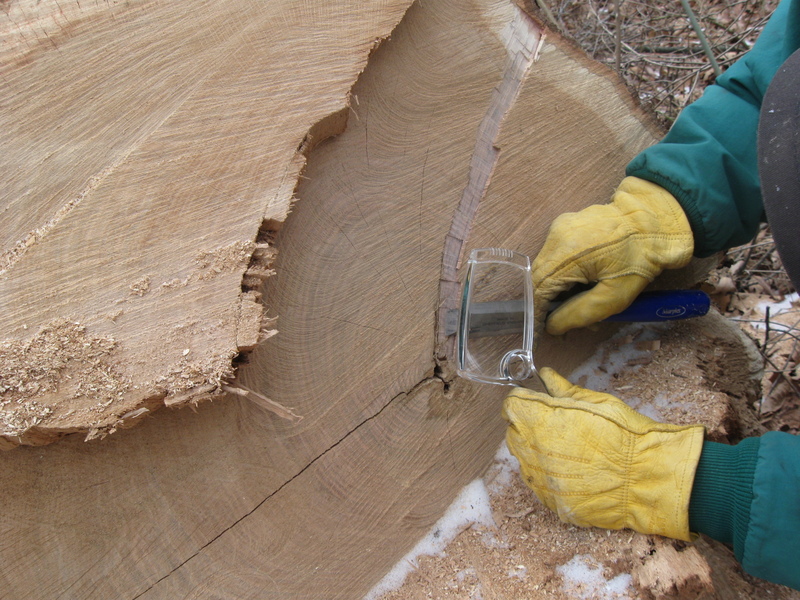 To make sure we could get a proper count of the rings, we used a chisel to cut a channel, and a magnifying glass and a chisel to count the rings. This view was taken facing southwest at approximately 1:00 PM on Sunday, January 18, 2009. We then used a marker to keep track of where we were in our count of the rings. 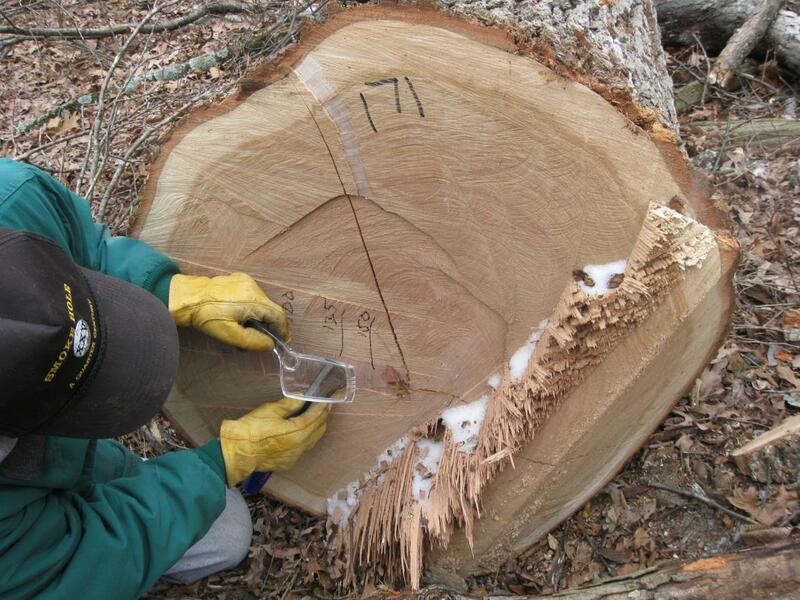 The National Park Service uses a chart to determine the age of of trees based on their species and size. It appears that either the chart is incorrect, or that someone isn’t using it correctly. This view was taken facing southwest at approximately 4:30 PM on Sunday, January 11, 2009. As a Gettysburg National Military Park spokesperson told National Public Radio in September, 2008, “It’s really kind of amazing that any tree would have been standing here after three days of fighting.” This view was taken facing southwest at approximately 4:30 PM on Sunday, January 11, 2009. 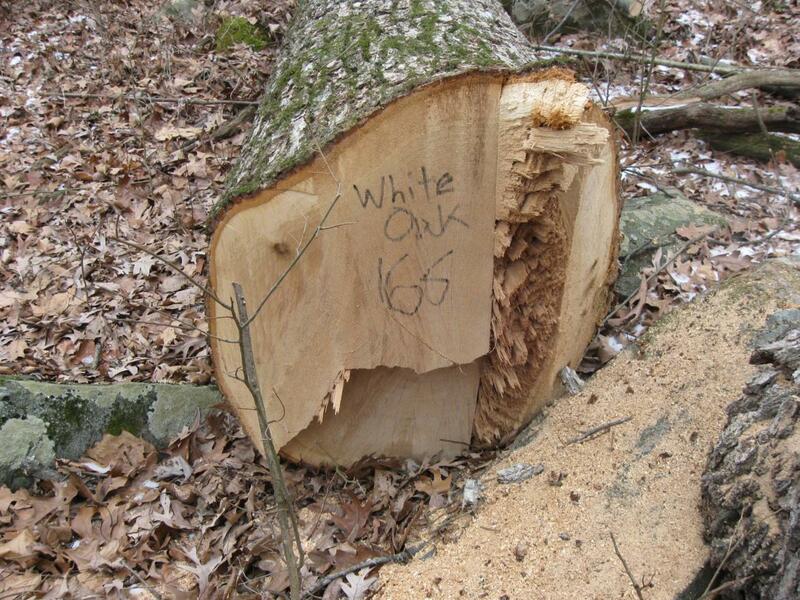 Witness Tree #4 is a White Oak that was 194 years old. So it started growing around 1815 when James Madison was President of the United States. Andrew Jackson had just won the Battle of New Orleans during the War of 1812. This tree was approximately 48 years old at the time of the Battle of Gettysburg. This view was taken facing south at approximately 1:00 PM on Sunday, January 18, 2009. According to the National Park Service Organic Act, the mission of the National Park Service is “…to promote and regulate the use of the…national parks…[whose] purpose is to conserve the scenery and the natural and historic objects and the wild life therein and to provide for the enjoyment of the same in such manner and by such means as will leave them unimpaired for the enjoyment of future generations.” This view was taken facing south at approximately 1:00 PM on Sunday, January 18, 2009. Superintendent John Latchar’s stated purpose of Battlefield Rehabilitation of Gettysburg is as follows: “One of the most important purposes of Gettysburg National Military Park is to preserve the topographic, landscape and cultural features that were significant to the outcome of the Battle of Gettysburg. That is the primary reason that Congress created this park in 1895.” This view was taken facing south at approximately 4:30 PM on Sunday, January 11, 2009. To paraphrase the National Park Service instructions to visitors regarding preservation of the resources at Gettysburg, “take only memories, and leave only footprints… because if anyone’s going to damage the resource, it’s going to be us.” This view was taken facing west at approximately 4:30 PM on Friday, January 16, 2009. Arkansas Monument Witness Tree on August 27, 2008. Farnsworth Charge Witness Tree on September 8, 2008. Sickles’ Witness Tree on November 10, 2008. Abraham Lincoln Baltimore Street Witness Tree on November 19, 2008. 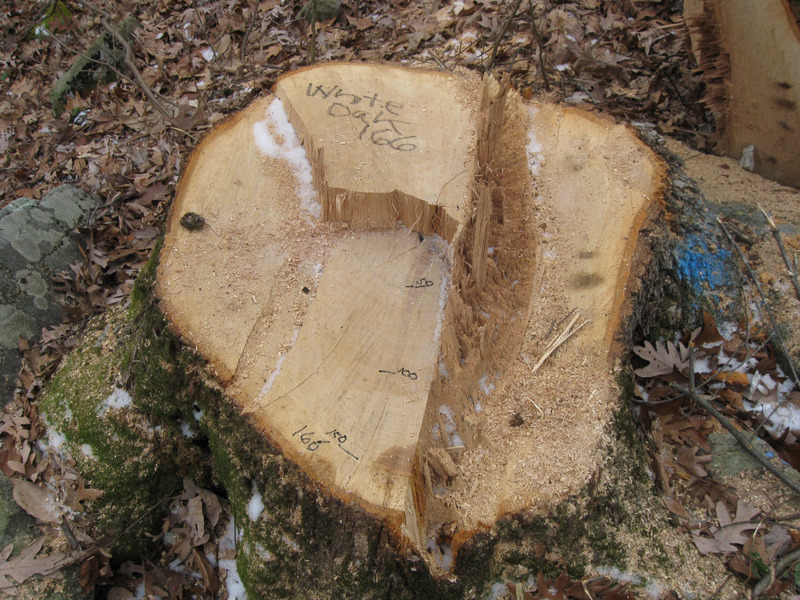 Henry Heth Wounding Tree Stump on November 28, 2008. Culp’s Hill Witness Tree: Split by an Artillery Shell? on November 30, 2008. Culp’s Hill Witness Tree: Photographed by M.B. Brady and Company on December 5, 2008. National Cemetery Witness Tree, Sickles Witness Fence Update on December 10, 2008. Another Baltimore Street Witness Tree on January 14, 2009. 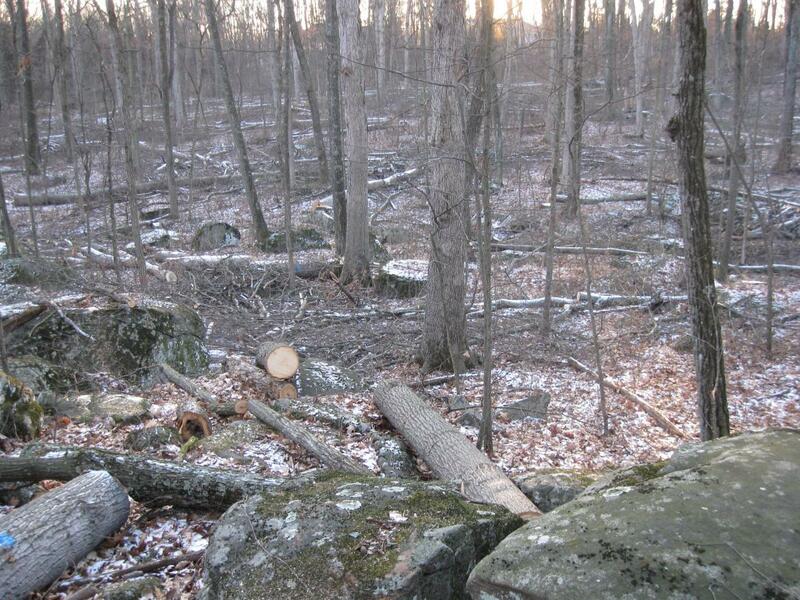 National Park Service Cuts Down a Witness Tree and Damages a Stone Wall on January 17, 2009. Left flank marker of Knap’s Pennsylvania Battery thrown behind NPS building on November 9, 2008. National Park Service moving flank markers on October 23, 2008. Dirt and gravel returning to the flank markers on October 15, 2008. Dirt and gravel being removed from the flank markers on October 10, 2008. Dirt and gravel burying the markers on October 9, 2008. Covering up their mistakes with asphalt touching boulders in The Loop on September 22, 2008.